MAPnificent! 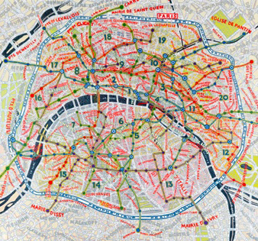 Artists Use Maps brings together a group of artists who creatively employ the philosophy and technique of mapping to convey information ranging from sociological data to aesthetic stimuli. The exhibit features paintings, works on paper and sculpture that reflect the artists concerns for the current state of our society, conveyed though charts and diagrams, and their admiration of the map as a symbol of longing and the unknown. 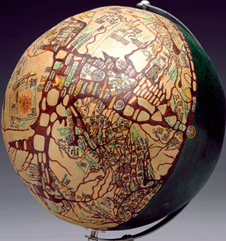 The works included either illustrate a scientific research in demographics, or a flow of capital, or distribution of patterns, but also present the artists reverence for maps. For some of the exhibiting artists, mapping is a tool to create interactive visuals with the help of sophisticated tools for image manipulation that arrange numbers into intricate geometrical forms. Maps are primarily received as directional; a subway or bus map is understood as a tool to get somewhere. In fact, the title of this exhibition borrows from a google-map application, MAPNIFICENT, which calculates the time between places via public transportation. For the artists, however, a map is often an end in itself: a work of art, filled with revelation and delight. Upcoming exhibition at The Center for Book Arts: Brother, Can You Spare…a Stack? Founded in 1914, AIGA remains the oldest and largest professional membership organization for design, with 66 chapters and more than 22,000 members nationwide. AIGA Philadelphia, the first local chapter, was established in 1981. We represent a variety of professions under the umbrella of communication design, ranging from book and type design to interactive design and experience design. Our annual roster of programs includes lectures, exhibitions, workshops, which both enrich the community (through our new headquarters in Old City, aptly called SPACE) and benefit our local membership of over 600 design professionals, educators and students. AIGAs mission is to advance designing as a professional craft, strategic tool and vital cultural force. This entry was posted in AIGA, Art in Philadelphia, Design, Design Philadelphia, Fine Art Philadelphia, Maps, Philadelphia Art Shows, Philadelphia Artists on January 30, 2013 by admin1. February 15th – Third Friday is the Figures exhibit for February. 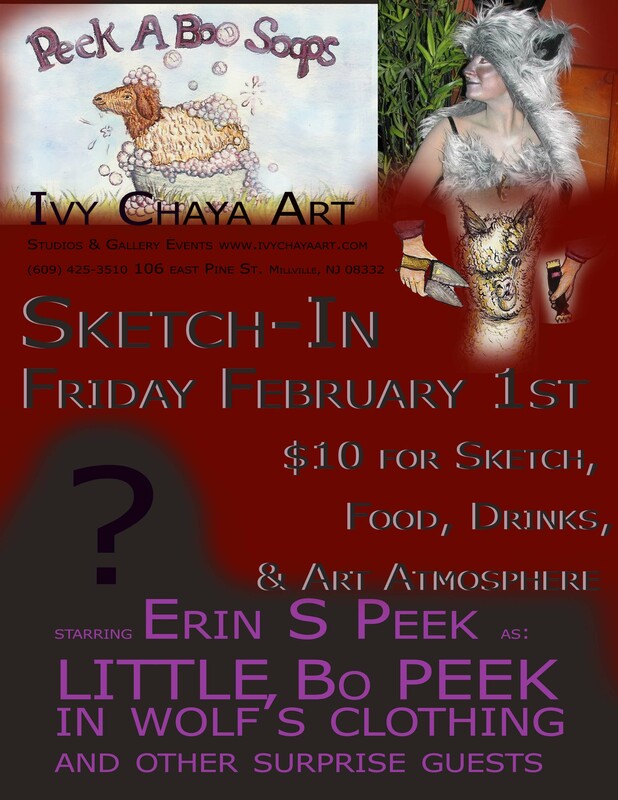 Figurative Art will represent James Ingraham fine art photography and digital media, Meed Barnett muti meedia artist, David Allen Baird sketch club president, Erin S. Peek “Peek A Boo Soaps and Shearing,” and Ivy Chaya artist & owner. All else check the website for info and updates www.ivychayaart.com and link to us on Facebook! This entry was posted in Fine Art Philadelphia, First Friday, Ivy Chaya Art, Millville, New Jersey Art, New Jersey Art Galleries, New Jersey artists, NJ, Philadelphia Art, Philadelphia Artists, Riverfront Renaissance Center for the Arts on January 30, 2013 by admin1. Bob Jackson is a fine artist able to elevate simple materials like old graph paper and ballpoint pens to an elegant language of signs, symbols, movement and line. The artist sketches quick drawings each less than an inch high as the model moves slowly through a series of athletic poses. The pages quickly fill up with hundreds of tiny croquis. In the historic studio artists draw intensely as the model, Stephanie, makes beautiful shapes in space. Check the new DoNArTNeWs for more images of Bob Jackson‘s drawings from the Moving Model Workshop and a description of how this video was produced. This video plays in full screen mode for a larger than life look at the drawings. This entry was posted in Art History, Art in Philadelphia, Drawings, Fine Art Philadelphia, Mixed Media Art, Philadelphia, Philadelphia Art, Philadelphia Art Alliances, Philadelphia Art Classes, Philadelphia Art Clubs, Philadelphia Art Galleries, Philadelphia Art Studios, Philadelphia Artists, The Plastic Club, Uncategorized, Works on Paper on January 29, 2013 by admin1. This entry was posted in Art in Philadelphia, Art Spaces Philadelphia, Fine Art Philadelphia, Mixed Media Art, Paintings Philadelphia, Philadelphia Abstract Art, Philadelphia Art, Philadelphia Art Alliances, Philadelphia Art Classes, Philadelphia Art Galleries, Philadelphia Art Installations, Philadelphia Art Shows, Philadelphia Artists, Philadelphia Artists, Philadelphia Pop Art, Recycled Art, Sculpture, Watercolors, Works on Paper on January 23, 2013 by admin1. 236 South 22 Street, Philadelphia. PA, 215 772 1911, hours Wednesday through Sunday 12:00 – 6:00pm. This entry was posted in Art in Philadelphia, Art Spaces Philadelphia, Fine Art Philadelphia, Paintings Philadelphia, Philadelphia, Philadelphia Art, Philadelphia Art Alliances, Philadelphia Art Galleries, Philadelphia Art Shows, Philadelphia Artists, Philadelphia Artists, Twenty-Two Gallery on January 20, 2013 by admin1.